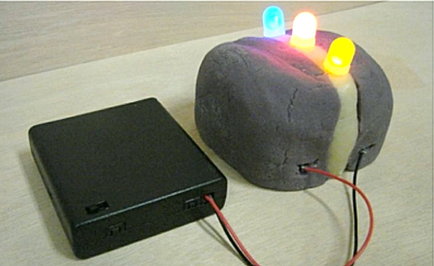 Create an electrical circuit using conductive and insulating dough. Please note that you or a parent volunteer will need to create your own dough. All supplies will be provided. You will need mixing bowls, spoons, pots, and a kitchen in order to make the dough. ​Students learn about conductors, insulators and resistance. Students build various circuits including working (closed) circuits, open circuits, short circuits and parallel circuits. Instructions for making the conductive dough are here. Instructions for making the insulating dough are here.